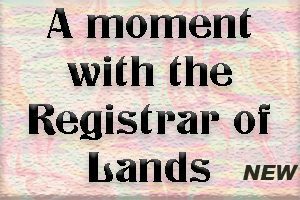 TAKE FURTHER NOTICE that any person who objects to the issuance of a new Land Certificate or who has knowledge of the lost Land Certificate must within the period of fourteen (14) days from the date of publication of this notice in the newspaper inform the Registrar of Lands in writing. TAKE FURTHER NOTICE that in the absence of an objection or information as to the existence of the lost Land Certificate within the time specified, the Registrar of Lands may proceed to cancel the original Land Certificate and issue a new Land Certificate in its place without further notice. Dated this 15th day of February 2017.